One of my favorite ways to increase my anti-oxidant levels is through juicing fresh veggies. This is the easiest way to provide mega-doses of powerful vitamins, minerals and living enzymes into the body. Because juicing removes the fibers from the fruits and veggies, it is easier on the digestive system and more live nutrients are able to make it into the bloodstream. If your digestion is not impaired it is good to consume some of the fibers at a later time such as in a salad. It is best to drink the juice fresh as that is when it contains the most nutritional value. Every minute it sits, the nutrients oxidize and are lost for good. Best to stick with organic ingredients if at all possible and only put your fresh vegetable juice in a glass. Plastic has dangerous xenoestrogenic chemicals that we don’t want inside of our body. Enjoy your juicing! Some of my favorite things to juice are green apples, cucumbers, celery, lemons and limes as these all make a lot of juice and are low in sugar and rich in nutrients. I like juicing things like dandelion, cilantro, parsley, bok choy, spinach, kale, ginger, etc. I would not add more than 1 small apple or more than 4-5 carrots at a time to keep sugar to a minimum. Anytime you are juicing higher sugar items always be sure to add in a whole lemon or lime. The citric acid will lower the glycemic impact and reduce the inflammatory component of the sugar. Lemons & Limes: These sour citrus fruits are rich in vitamin C and vitamin P otherwise called citrus bioflavonoids. Studies have shown that vitamin P enhances the anti-oxidant capability of vitamin C. These bioflavonoids also improve capillary permeability and overall blood flow. This is especially important for oxygenating tissues and maintaining normal blood pressure. These anti-oxidants have also been shown to reduce swelling, venous backup and edema (1). The citric acid in the lemon/lime also is a natural anti-septic that reduces unwanted microbes in the body. The citric acid, vitamin C, bioflavonoids and rich electrolyte content in these fruits has a very strong alkalizing effect once it is metabolized in the body. Green Apples: Green apples are more sour than traditional red apples and contain less sugar and more acetic acid. The acid itself is a natural anti-septic and improves the function of the liver, gall bladder, stomach and intestines. This is the same acid that is the major component of apple cider vinegar. Green apples also have a strong alkalizing effect on the body and contain a unique anti-oxidant procydin that has anti-cancer benefits (2). Some vegetables produce a lot of juice because they are rich in water and electrolytes with very little to any sugar. 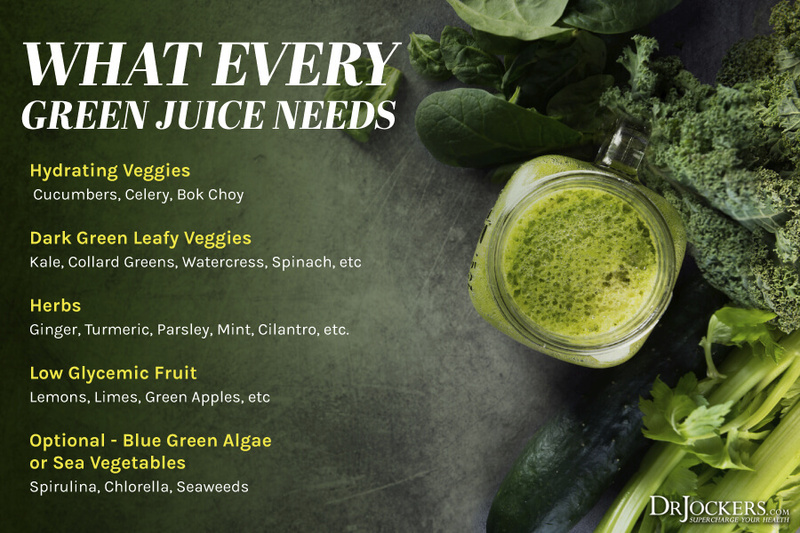 These should be foundational pieces to your juicing routine. The best hydrating vegetables are cucumbers, celery & bok choy. Cucumbers: Cucumbers are loaded with the mineral silica, which is an essential component for healthy connective tissue (muscles, ligaments, cartilage, bone, & skin). It is also full of ionic potassium, magnesium, & vitamin C which give it a powerful alkalizing effect within the body. Additionally, cucumbers are particularly rich in fluids that hydrate the skin, joints, and tissues (3). Celery: Celery is rich in water and electrolytes such as potassium and sodium and the trace mineral silica. Celery also contains unique antioxidant phenols called dihydrostilbenoids that are similar to resveratrol. Celery has a very strong alkalizing effect on the body and is a great base for juicing (4). One of the most powerful life-giving substances on the planet is chlorophyll. This is the pigment that gives green foods their color. Chlorophyll is the major player in the photosynthetic process which allows plants to obtain energy from light by converting the sun’s rays into chemical energy. Spinach: Spinach is a powerful source of chlorophyll and glycoclycerolipids that protect the digestive tract from inflammatory damage. These glycoclycerolipids are the main fatty acids that makeup the cell membranes of light-sensitive organs in chlorophyll containing plants. They have powerful immune boosting and anti-cancer effects (8). Additionally, spinach is an important source of copper, zinc and selenium which boost immunity. Collards: These fan-like greens stand out as a nutritional superstar. Their vitamin K, A, C and magnesium levels are off the charts and they are rich in folate, B2 and B6 (9). Collards are also rich in isothiocyanates which are powerful sulfur compounds that protect the P53 gene. The P53 gene is considered the guardian of the genome and regulates a normal cell cycle. Mutated p53 gene leads to failure in the normal cell cycle and the development of cancerous formations (10). Kale: Some of the hottest nutrients present in kale include the glucosinolates and methyl cysteine sulfoxides (11). These super-nutrients help to activate detoxifying enzymes in the liver that play an important role in neutralizing carcinogenic substances. One such glucosinolate, sulfuraphane, is formed when kale is either chopped or chewed. Sulfuraphane has been shown to alter the genetic expression of the liver allowing to more effectively use its detoxification enzymes (12). Lacianto kale contains more water and a better flavor than curly kale. Curly kale is very challenging to juice and is not recommended. I stick with lacianto kale for juicing and curly kale for things like kale chips. WaterCress: Watercress is a fast-growing, aquatic or semi-aquatic perennial and one of the oldest known leaf vegetables consumed by humans. It has a significant amount of bioavailable B6, magnesium and folate and acts as a great digestive aid. It is also rich in chlorophyll and carotenoid anti-oxidants. Cereal Juices: This would include wheatgrass, barley grass, oat grass and rye grass among others. These are the grass portions and not the grains. Therefore, they are free of gluten and are very low-carb and nutrient dense. They are best juiced alone and without other veggies mixed in. Cows can live an extremely healthy and long life surviving solely on these cereal grasses. Humans cannot digest the tough fibers and the only way to really consume these is through juicing.Cereal grasses are some of the absolute richest sources of blood cleansing chlorophyll. They also contain tons of carotenoid anti-oxidants, key methylating agents such as magnesium, B2, B6 and folate. Most people in western society have grown up without using bitter herbs on a regular basis. Bitter herbs are not the most tasty but they are outstanding for our health. These herbs help produce digestive enzymes and improve liver and gallbladder function as well as anything. When the tongue recognizes the bitter flavor it sets off a set of reactions in the neuroendocrine system that is labeled the “bitter reflex.” This process is mediated by the hormone within the stomach called gastrin which stimulates the flow of hydrochloric acid. This reflex then goes down and helps with liver and gallbladder secretions of bile and pancreatic enzyme secretions. Experts believe that the bitter reflex helps to improve the structure and function of all the digestive organs. “Bitter is good for the liver” is a popular slogan describing the benefits of these herbs. They are also good for cleansing the blood, digestive system, kidneys and urinary tracts. Bitter herbs are divided into two major categories: cholagogues, which increase the flow of bile, and hepatoprotectants which repair and protect the liver from overexposure to toxins. The cholagogues include dandelion root, parsley, burdock root, artichoke, ginger and goldenseal. While hepatoprotectants include turmeric and milk thistle. Be sure to include some of these bitters in your juicing schedule. Dandelion: This is rich in vitamin C and bioflavonoids. They are also very high in highly absorbable methylating agents such as vitamin B2, B6 and folate. Rich in minerals such as potassium, iron and zinc, it releases excess fluid out of the body detoxifying the kidney and liver. Dandelions support digestion, reduce swelling and inflammation, and treat jaundice, edema, gout, eczema and acne (13). Parsley: Parsley is super rich in chlorophyll and also contains about three times the amount of vitamin C by volume as an orange. Vitamin C is extremely important for healthy immune function and youthful skin & joints. Additionally, it contains carotenoid anti-oxidants lutein and zeaxanthin which enhance eye function and help the body neutralize damage from UV radiation (14). Coriander/Cilantro: This is a powerful heavy metal detoxifier. This is due to its strong array of phytonutrients and chlorophyll. This is extremely good for blood, liver and kidney purification. Be sure to utilize cilantro in your juices to help pull out heavy metals like aluminum, mercury and nickel (15). Ginger: Ginger is classified as a carminative (reducing intestinal gas) and an intestinal spasmolytic (soothes intestinal tract) while inducing gut motility. Ginger is known to reduce fever related nausea, motion sickness, and feelings of “morning sickness.” Additionally, it helps aid in the production of bile, making it particularly helpful in digesting fats (16, 17). Turmeric: The orange Asian herb turmeric has been traditionally used for centuries by Ayurveda and Chinese medicine. Curcumin is the most powerful active anti-inflammatory compound within turmeric. Curcumin has been shown to detoxify the liver, boost glutathione levels and be a powerful suppressor of chronic inflammatory mediated disease processes (18). Milk Thistle: Milk thistle was used by medical herbalists in the late nineteenth century to treat varicose veins and liver, spleen and kidney disorders. Today, it is primarily used to improve the function of the liver, kidneys and gastrointestinal system. Many individuals have seen dramatic improvement using milk thistle for health issues such as psoriasis, menstrual problems, jaundice and poor circulation (19) . 1 Lemon diced up, 1 small granny smith apple diced up, 2 handfuls of baby spinach, a handful of dandelion, a handful of cilantro, 1 diced up cucumber and an inch of ginger root in your juicing routine. 1 small granny smith apple diced up, 1 lime diced up, 2 handfuls of watercress, a handful of dill weed, a handful of parsley, 1 stalk of celery and an inch of ginger root. 1 small Granny Smith Apple, 1 lemon/lime, 1 stalk of bok choy and a cucumber diced, 2 handfuls of spinach, a handful of parsley, a handful of cilantro, a handful of dandelion, an inch of ginger root and an inch of turmeric root. There are endless combinations you can make and they all really depend upon what is available to you. It may be challenging for you to find some of the above mentioned vegetables so you have to go with what you can get. Be sure to check out local farmers markets where you may have access to fresh veggies you have trouble finding in your health food stores. Yes you can. Try it out and see if you are able to maintain ketosis. I am as long as I am doing intermittent fasting along with it. when in any of the recipes of juicing there is 1 lemon or lime; is that with the skin or need to be peeled? and since we say juicing; do we need a juicer or a blender? Hey Derek, yes I use the whole lemon including peel with a true juicer. thank you so much for your reply. So does will apply as well to a blender? what i mean is that i should put the lemon as a whole in a blender? should i de seed the lemon or limes that i use if i use a blender? since with a juicer, the seed will be out from the juice. Will you get the same health benefits if you make these juice recipes as smoothies? I do not have a juicer, but I do have a Vitamix. Yes, they can still be very good! Do you have any recommendations for brands of juicers that will give the best nutritive benefit of the vegetable juice and not overheat/”pasteurize” the juice? i use a lemon juice with hot water and a table spoon of honey ever morning, is that good for your liver? Hey Pina, yes this is good for your liver. Be sure the honey is raw and local sourced. I read that “All cruciferous veggies are goitrogenic, meaning they contain substances that suppress thyroid function when consumed raw.” therefore we should not juice things like brocoli raw, can you comment on the validity of this and whether I should continue to include them in mu juicing regime? Hey Elizabeth, I used to be concerned about this as well until I did a literature review and found that the idea of goitrogenic substances in cruciferous vegetables is highly overblown. The research shows that the goitrogens in these foods have no impact on thyroid function. Green juice is always a perfect recipe for weight loss. Hi I really need to know if I don’t have a juicing machine and I blend it, will I still get it’s effects?? You will get similar effects but with loads of fiber. You can try it and see how your body responds! 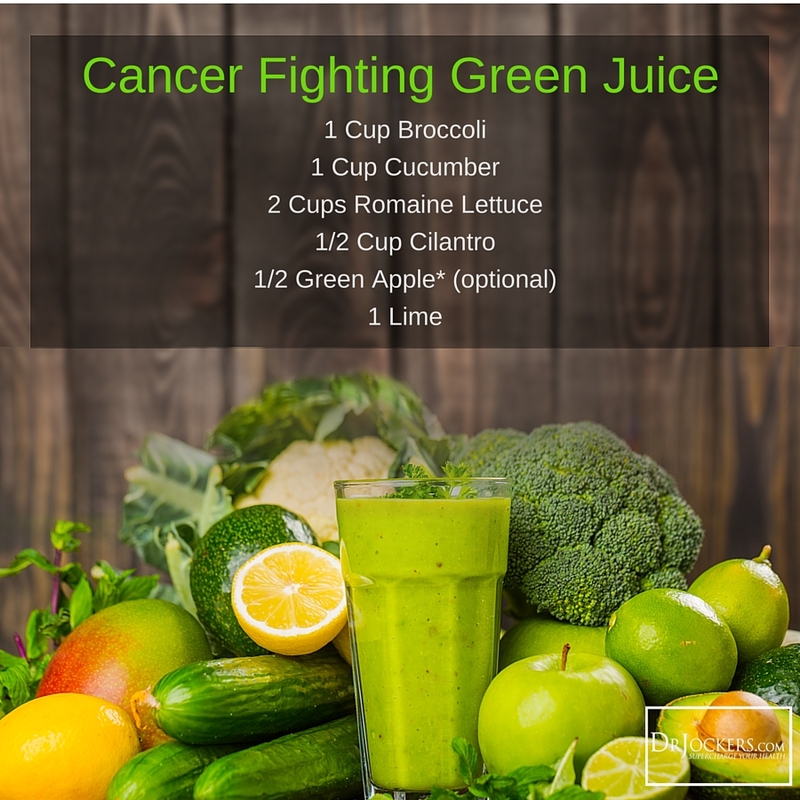 This is an awesome article detailing all the benefits of green juicing–I will certainly love to taste them and improve my health. Thanks a lot Dr Jockers! should i add water or fruit to my juice? if 1 want to add water what type of water should i add?